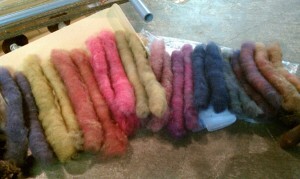 Before spinning, it is generally necessary to separate and align the fibers to ensure a smooth and consistent result. A drum carder (pictured) is immensely helpful to getting this done fairly quickly and efficiently. Fibers come off the large drum in a sheet called a “batt”, and I usually wrap them up in little balls to keep them neat and tidy until they are spun. 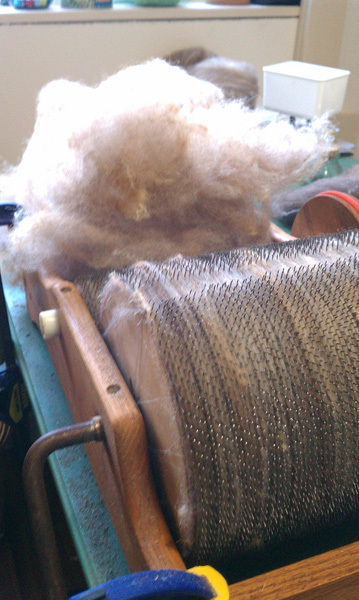 Hand carding results in smaller batches of fibers, which are generally rolled off the carders into “rolags”.